If you have been diagnosed with breast cancer, you probably have a lot of questions and concerns. 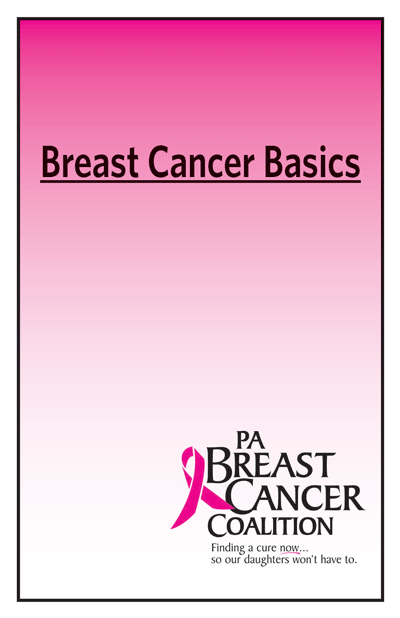 The PA Breast Cancer Coalition is here to help. We have compiled a free e-book "Breast Cancer Basics" with information about what to expect through treatment, recovery and beyond. Breast cancer is the most common type of cancer among women in the United States (other than skin cancer). In 2012, about 227,000 American women will be diagnosed with breast cancer. The most common type of breast cancer is ductal carcinoma. This cancer begins in cells that line a breast duct. About 7 of every 10 women with breast cancer have ductal carcinoma. The second most common type of breast cancer is lobular carcinoma. This cancer begins in a lobule of the breast. About 1 of every 10 women with breast cancer has lobular carcinoma. Other women have a mixture of ductal and lobular type or they have a less common type of breast cancer. The stage of breast cancer depends on the size of the breast tumor and whether it has spread to lymph nodes or other parts of the body. Doctors describe the stages of breast cancer using the Roman numerals 0, I, II, III, and IV and the letters A, B, and C.
A cancer that is Stage I is early-stage breast cancer, and a cancer that is Stage IV is advanced cancer that has spread to other parts of the body, such as the liver. The stage often is not known until after surgery to remove the tumor in the breast and one or more underarm lymph nodes. Stage 0 is carcinoma in situ. In ductal carcinoma in situ (DCIS), abnormal cells are in the lining of a breast duct, but the abnormal cells have not invaded nearby breast tissue or spread outside the duct. The breast tumor is no more than 2 centimeters (no more than 3/4 of an inch) across. Cancer has not spread to the lymph nodes. The tumor is no more than 2 centimeters across. Cancer cells are found in lymph nodes. The tumor is no more than 2 centimeters across, and the cancer has spread to underarm lymph nodes. Or, the tumor is between 2 and 5 centimeters (between 3/4 of an inch and 2 inches) across, but the cancer hasn't spread to underarm lymph nodes. The tumor is between 2 and 5 centimeters across, and the cancer has spread to underarm lymph nodes. Or, the tumor is larger than 5 centimeters across, but the cancer hasn't spread to underarm lymph nodes. The breast tumor is no more than 5 centimeters across, and the cancer has spread to underarm lymph nodes that are attached to each other or nearby tissue. Or, the cancer may have spread to lymph nodes behind the breastbone. Or, the tumor is more than 5 centimeters across. The cancer has spread to underarm lymph nodes that may be attached to each other or nearby tissue. Or, the cancer may have spread to lymph nodes behind the breastbone but not spread to underarm lymph nodes. The breast tumor can be any size, and it has grown into the chest wall or the skin of the breast. The breast may be swollen or the breast skin may have lumps. The cancer may have spread to underarm lymph nodes, and these lymph nodes may be attached to each other or nearby tissue. Or, the cancer may have spread to lymph nodes behind the breastbone. The breast cancer can be any size, and it has spread to lymph nodes behind the breastbone and under the arm. Or, the cancer has spread to lymph nodes above or below the collarbone.